Description: The ITGB3 gene encodes glycoprotein IIIa (GP IIIa), the beta subunit of the platelet membrane adhesive protein receptor complex GP IIb/IIIa. 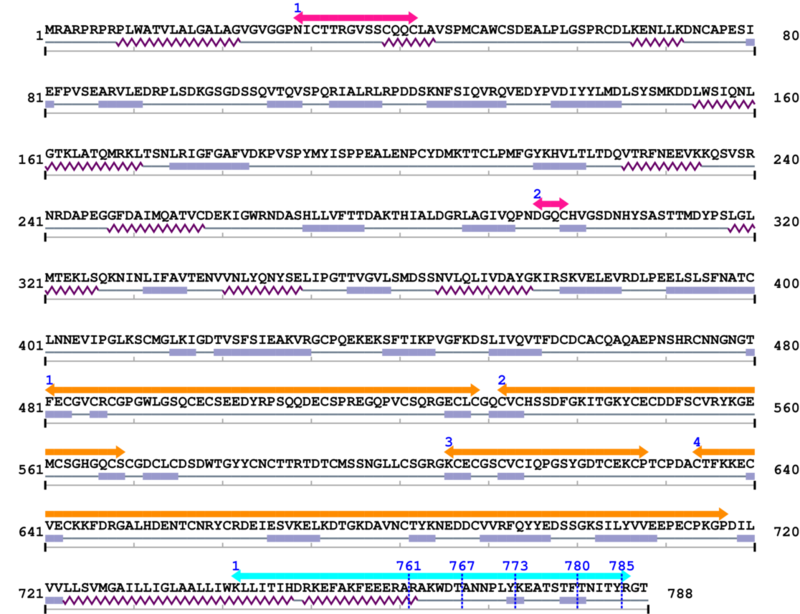 The alpha subunit, GP IIb, is encoded by the ITGA2B gene (OMIM:607759). The GP IIb/IIIa complex belongs to the integrin class of cell adhesion molecule receptors that share a common heterodimeric structure with alpha and beta subunits (summary by Bray et al., 1987 and Bajt et al., 1992). Function: The GP IIb/IIIa complex mediates platelet aggregation by acting as a receptor for fibrinogen. The complex also acts as a receptor for von Willebrand factor and fibronectin (Prandini et al., 1988). Source Reference: [PubMed ID: 7592818] Du X, Saido TC, Tsubuki S, Indig FE, Williams MJ, Ginsberg MH, Calpain cleavage of the cytoplasmic domain of the integrin beta 3 subunit. J Biol Chem. 1995 Nov 3;270(44):26146-51. [PubMed ID: 24109241] ... Gianni T, Leoni V, Campadelli-Fiume G, Type I interferon and NF-kappaB activation elicited by herpes simplex virus gH/gL via alphavbeta3 integrin in epithelial and neuronal cell lines. J Virol. 2013 Dec;87(24):13911-6. doi: 10.1128/JVI.01894-13. Epub 2013 Oct 9. [PubMed ID: 24437181] ... Rebrova TIu, Muslimova EF, Afanas'ev SA, Sergienko TN, Repin AN, [Resistance to clopidogrel and polymorphism of P2RY12 and GPIIIA genes in patients with chronic coronary heart disease]. Klin Med (Mosk). 2013;91(8):29-31. [PubMed ID: 24437179] ... Zotova TIu, Miandina GI, Frolov VA, Komarova AG, Zotov AK, [The influence of ITGB3 gene polymorphism on the frequency of arterial hypertension in patients with acute coronary syndrome]. Klin Med (Mosk). 2013;91(8):22-4. [PubMed ID: 11723131] ... Datta A, Huber F, Boettiger D, Phosphorylation of beta3 integrin controls ligand binding strength. J Biol Chem. 2002 Feb 8;277(6):3943-9. Epub 2001 Nov 26. [PubMed ID: 10896934] ... Kirk RI, Sanderson MR, Lerea KM, Threonine phosphorylation of the beta 3 integrin cytoplasmic tail, at a site recognized by PDK1 and Akt/PKB in vitro, regulates Shc binding. J Biol Chem. 2000 Oct 6;275(40):30901-6. [PubMed ID: 7592818] ... Du X, Saido TC, Tsubuki S, Indig FE, Williams MJ, Ginsberg MH, Calpain cleavage of the cytoplasmic domain of the integrin beta 3 subunit. J Biol Chem. 1995 Nov 3;270(44):26146-51. [PubMed ID: 1429573] ... Bajt ML, Loftus JC, Gawaz MP, Ginsberg MH, Characterization of a gain of function mutation of integrin alpha IIb beta 3 (platelet glycoprotein IIb-IIIa). J Biol Chem. 1992 Nov 5;267(31):22211-6. [PubMed ID: 1438206] ... Chen YP, Djaffar I, Pidard D, Steiner B, Cieutat AM, Caen JP, Rosa JP, Ser-752-->Pro mutation in the cytoplasmic domain of integrin beta 3 subunit and defective activation of platelet integrin alpha IIb beta 3 (glycoprotein IIb-IIIa) in a variant of Glanzmann thrombasthenia. Proc Natl Acad Sci U S A. 1992 Nov 1;89(21):10169-73. [PubMed ID: 1430225] ... Wang R, Furihata K, McFarland JG, Friedman K, Aster RH, Newman PJ, An amino acid polymorphism within the RGD binding domain of platelet membrane glycoprotein IIIa is responsible for the formation of the Pena/Penb alloantigen system. J Clin Invest. 1992 Nov;90(5):2038-43. [PubMed ID: 1382574] ... Jiang WM, Jenkins D, Yuan Q, Leung E, Choo KH, Watson JD, Krissansen GW, The gene organization of the human beta 7 subunit, the common beta subunit of the leukocyte integrins HML-1 and LPAM-1. Int Immunol. 1992 Sep;4(9):1031-40. [PubMed ID: 1371279] ... Bajt ML, Ginsberg MH, Frelinger AL 3rd, Berndt MC, Loftus JC, A spontaneous mutation of integrin alpha IIb beta 3 (platelet glycoprotein IIb-IIIa) helps define a ligand binding site. J Biol Chem. 1992 Feb 25;267(6):3789-94.